Getting up every morning, opening your analytics, and seeing low trial conversions is a struggle every product manager or SaaS founder knows. You spent so much time and money to get that lead into a free trial, and in most cases, they leave your product and never come back. It’s natural for some users to stick and some to drop off, but there are tactics you can use to directly combat losing users before they convert to premium. From a revenue perspective, it’s mission critical to patch the leak at this stage of the funnel, because acquiring a new user costs 500% more than retaining an existing sign-up. Any dollar you put into acquisition would be worth $5 in retention when you consider how much more marketing effort is required to drive action, and the customer value of an existing user versus a new one. With that in mind, let’s dive into four ways you can fix that disheartening drop-off most SaaS companies find with free trial users. When it comes to converting users from trial to paid, data from Sixteen Ventures’ founder Lincoln Murphy suggests the average benchmark for free-to-paid conversion is about 3%. Metrics from individual companies range between 2% (GoToMeeting) and 15% (Chargebee). In short, when running a freemium SaaS business, you can expect the vast majority of trial users won’t end up converting. But what are methods that real companies are using to expand their customer base? At Chameleon, we work with SaaS companies to build in-product onboarding and retention campaigns every day. We’ve found that new users adopt and convert best when they’re guided to specific value. Specific value doesn’t mean an exhaustive tour of the interface and every feature. You should instead take a goal-driven approach and show users how to do the one or two most important things. There are users at each stage of the flow, and your job is to get them through to the next step with tactics that fit their current mindset, goals, and readiness to engage. Your first goal should be to deliver the “Aha moment” as soon as possible, and then activate your users with contextual prompts based on persona or behavior. 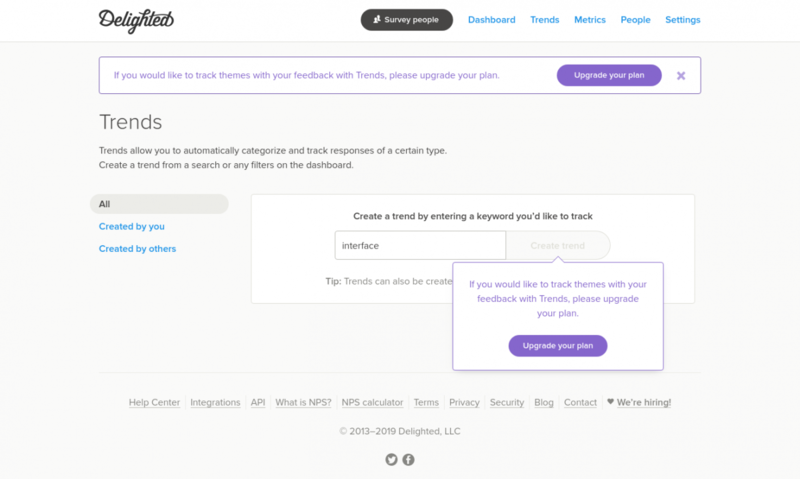 When Delighted’s trial users check out premium features, Delighted shows them what can be achieved and which problems can be solved with these premium features — but in order to use them, the customer needs to upgrade their plan. It’s the perfect example of using contextual prompts to drive user activation and improve trial to paid conversions. 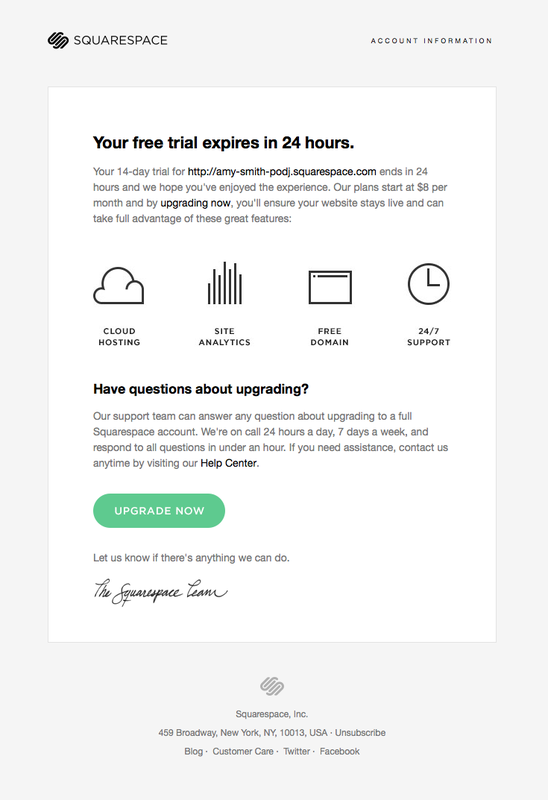 Converting your trial users to paid ones starts when your potential customers make first contact with your landing page and register for a free trial. It continues through the in-app experience and interactions with support, and is perpetuated with lifecycle emails and educational content on the product and use cases. Now that we understand the basics of user onboarding and can roughly map the SaaS user journey, let’s learn more about the four ways you can leverage different channels, contexts, and prompts to convert more free trial users. In B2B SaaS, webinars are one of the most popular ways for users to learn about your product’s problem solutions, how it works, and what value they can expect. Hubstaff found webinars to be so great at converting free trial users that they made getting trial users to sign up for their webinar priority number one. He is totally right! Webinars are a great way to engage with your trial customers in a more interesting way. Not to mention, webinars will help you build better relationships. Engaging with your trial customers, making connections, and improving relationships is crucial, since afterwards, they will not just become your paying customers, but will also climb up in your NPS scoreboard and very likely refer your product if you make a lasting impression early on. But, in order to create great relationships with your customers and supercharge your trial to premium conversions, first, you will need to learn how to adapt the webinar format for user onboarding. Of course, I’m not saying that, if you’re selling a product that helps digital marketers create better campaigns, you should talk with your trial customers about selling potatoes or toothbrushes. The Intercom team reported that using webinars in their user onboarding flow helped them to increase the lifetime value of the customers and boost their trial to premium conversions. In their webinars, Intercom talks with its trial users about the benefits of using their software, problem solutions, and features’ use cases. They discuss both trial and premium features and how the mix of them can be a winning solution for their customer’s business. By watching them, Intercom’s trial users are encouraged to take action, try new features, and solve their problems. This has resulted in converting trial users into premium ones, and also upgrading packages and buying more products as they’re already introduced to them through the webinars. Another great example of hosting webinars for your trial users to encourage their conversion is Close.io. The Close.io team found that one of their most ideal audiences are sales leaders in startups who are often remote. For that reason, Close.io creates different webinars about building remote sales teams. Even if their product isn’t about hiring or managing the remote team, people behind Close.io realized this type of webinar suits their overall marketing strategy very well. Based on all of this, your webinars can and should cover different topics. And for the best conversions, try to stick with the content your audience loves the most. If you’re not sure what type of content they like, ask them by building surveys and asking email readers to respond with feedback to your content. This sounds like a cliché, but it’s the truth. Your mission is to help your customers grow and prosper. So, provide them with as much value as you can. Honestly, if you need to write a 200-page book, write it! Prepare blueprints, checklists, ultimate guides, and how-to’s that deal with their most pressing issues. Take the opportunity to hint at your product’s functionality to engage readers with specific problems, or write later-funnel content directly about feature use cases to give a trial user the motivation — the carrot at the end of the stick — they need to upgrade. Sharing amazing value will always be unbeatable. HubSpot runs many free webinars for people around the world — website visitors, trial customers, and premium users. Its database of webinars is huge, and you can choose between various topics. With its amazing content, HubSpot is generating a ton of inbound leads across its various personas. Since HubSpot usually touches multiple teams in the company (and organizations from agencies to enterprises), its webinars are divided up by categories that describe which customer goal or persona they serve. You probably have hundreds of questions regarding webinars, and for sure, we can talk for hours and hours about this. But, before you get bored, let’s jump on the second way to boost your trial conversions. By one Salesforce report, the average email marketing campaign’s ROI is 3800%, which makes email sequences one of the best ways to skyrocket your growth and improve trial to premium conversions. Time-based emails – emails that are sent on a predetermined schedule, for example, when the user signs up, or two days before the trial ends. Triggered emails – emails that are sent when your trial users do some particular action (for example, when they add their teammates in the app or connect an integration). For example, you can use email sequences to clearly tell your users what to do. This will push your trial users towards the “Aha moment” and, later, user activation. Wistia, the online software for video hosting, is a great example of this! Reminding your users of their “abandoned” actions will force them to move towards and improve their skills of using your product. The copy is as lean as can be to keep attention. 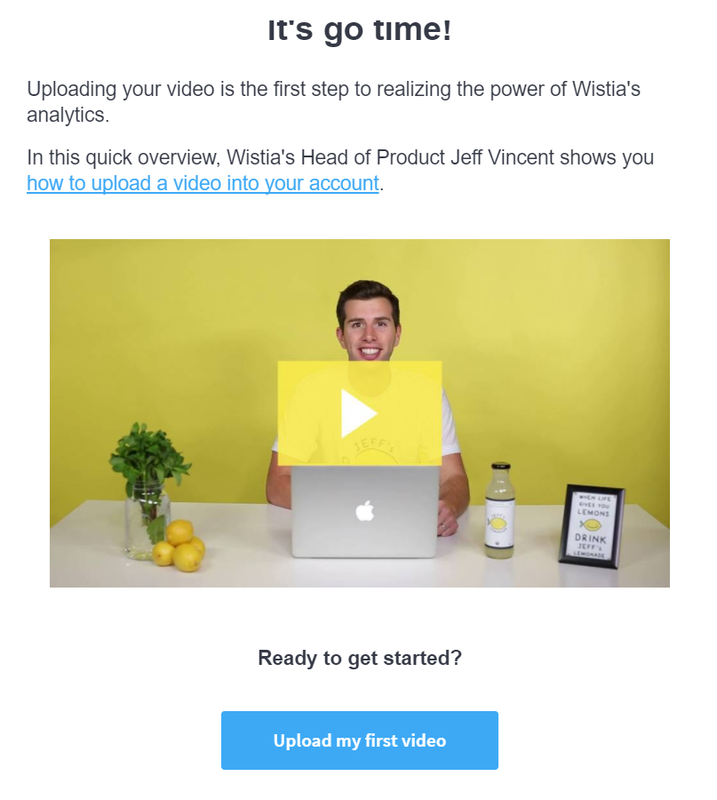 Using videos in your email sequences will help you build better relationships with your customers, engage with them more closely, and help drive action towards next steps. A clear call-to-action leads to better conversions. As soon as your trial user creates their account (or one day after), send them an email showcasing your unique value propositions and most important features. One of the very first emails you’re sending to your trial users should have an educational purpose (for example, quick product tutorials or product demos). Ask your trial customers to accomplish a retention-linked goal in order to lead them to your activation events. Send triggered emails congratulating them on finishing an important in-app onboarding step. Add retention emails to your onboarding flow. The purpose of retention emails is to inform your trial customers that their trial period will end very soon. Usually, you can do this a few days before, or earlier with a special offer. Nothing will ever beat personalization. In a world where everything is almost completely automated and generic, personalization is the key to standing out and connecting with prospects. By Evergage’s research, 59% of customers said personalization influences their purchase decisions, and that 77% of customers chose, recommended, or paid more for products from companies which focus their efforts on bringing personalized experiences. Just take email outreach for example. Are more likely to respond to a generic or template, or one that reads like it’s from a person who knows and understands you? The philosophy is the same in user onboarding. The future of building great in-app experiences and product walkthroughs lies in showing the right messages at the right time to the right people. With a more personalized user journey, your trial customers are more likely to respond with your desired answers and outcomes. For example, at Chameleon, we personalized our user onboarding flow by company persona. Generally, larger companies want a high-touch sales process with consultations, and startups want to get going right away, self-serve. As for personalization, you can find numerous examples of products which offer a custom onboarding flow based on what they know about the user’s role, team size, location, etc. All of those questions have one purpose: to ensure easier and better user onboarding for the end user, and in turn raise activation. 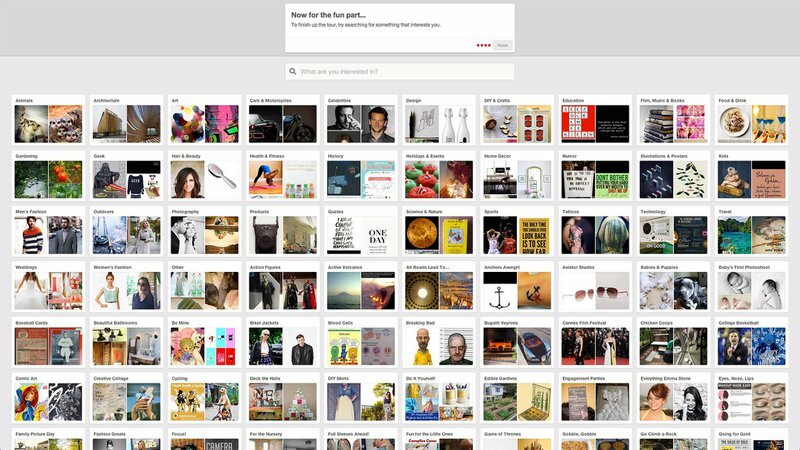 Great examples include Netflix and Pinterest: both ask you to choose the topics you’re interested in or to choose movies you already like, so they can personalize your feed as soon as you open the app. When it comes to showing targeted in-app messages to your users, a best practice is to trigger messages based on things the user has just done. 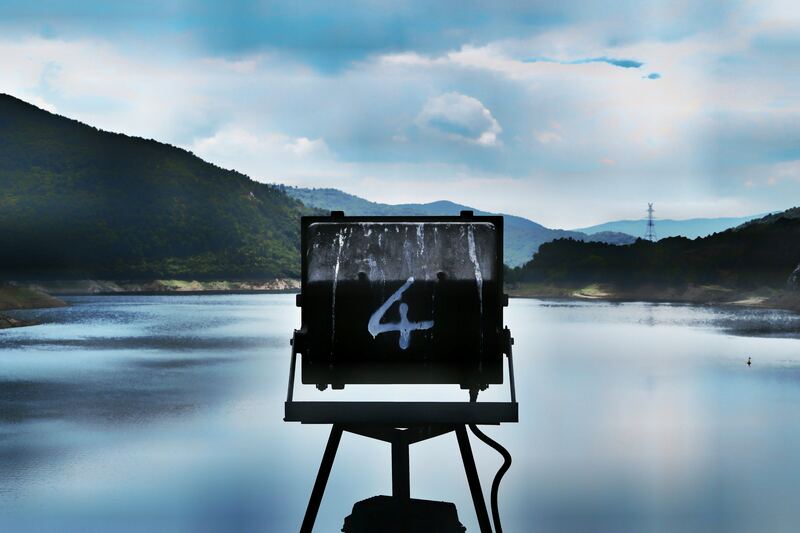 This makes the messages immediately contextual and meaningful, and more likely to drive action. 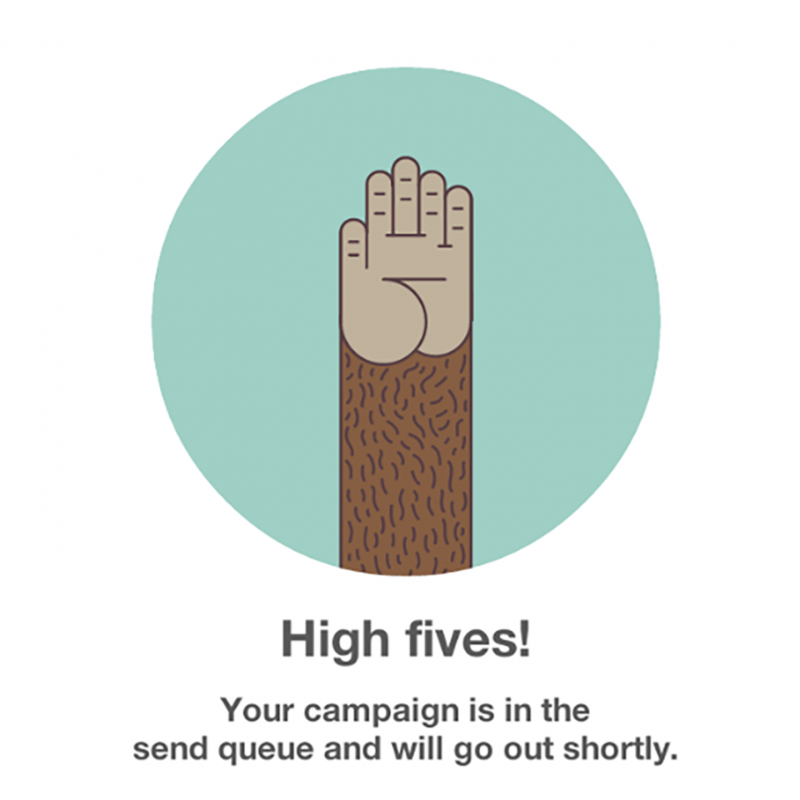 A great example of this is Mailchimp’s High Five! Whenever this cute chimp offers a high five, it makes users feel good and triggers the urge to send more campaigns (while communicating a unique and quirky brand identity). On the other hand, if you’re already collecting some basic information about your trial users, like their name or the name of their company, why don’t you feature that in your user onboarding? For example, if your user onboarding is based on steps, how about adding a “Congrats, Josh, you have just 3 more steps to go!” in-app message to your user onboarding flow? Or a tour that branches based on the information collected about the user’s goals or job function? – Build your in-app messaging flow – your developers can do this for you, or you can use a no-code platform. – Make every step or in-app message clear, understandable, and accompanied by an engaging call-to-action. Don’t just educate — market and drive action. – Specifically target your trial users – the best ways to target your trial users are by specific events and properties inside the app, data sources, or campaigns. Build a solid knowledge base. A knowledge base with all possible articles about your product and all possible questions your trial user could have as well as FAQs is a great way to keep your users on the platform and push them towards product adoption. Your support could be the deciding factor between your product and a competitor’s, plus, you can deflect common support queries by covering them in a knowledge base instead of wasting human resources. Dedicated website pages like competitor comparisons, or use cases separately written for all features or parts of your product will help you to convert more website visitors, but also to convert on-the-fence triallers. Include these in your lifecycle emails and measure whether users who engage with specific case studies and posts are more likely to upgrade. Content doesn’t necessarily just need to contain the written word; it could also be videos, slides, or audio. Showcasing short tutorials and product tours in your user onboarding can be a powerful way to convert by teaching in the user’s preferred medium. By Wyzowl’s research, if you give your users both video and text on the same page, 72% percent of people will choose to watch video over reading. 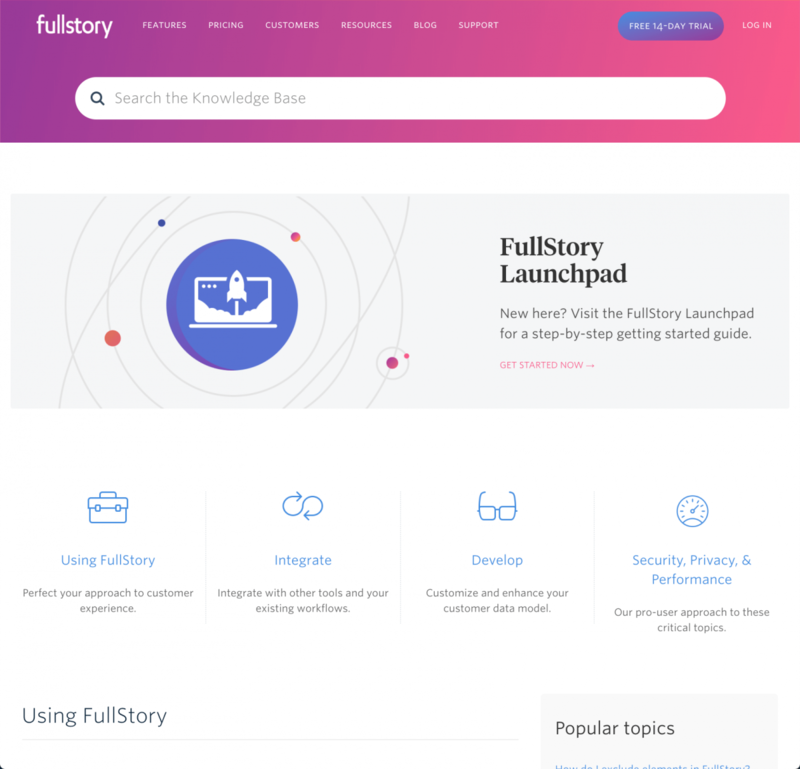 In its knowledge base, you can find best practices to teach users how to get real results and be successful, technical documentation on integrations, etc. 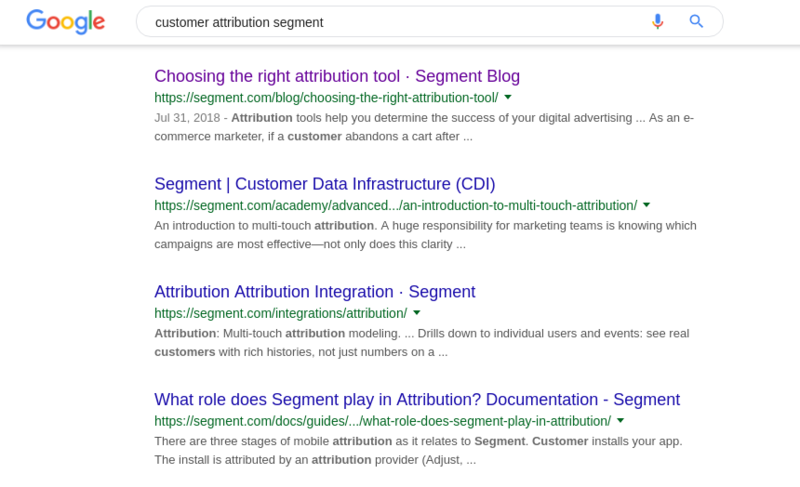 Use cases are another great example of how to improve your trial to paid conversions by showing content directly related to features and problem solutions. They can rank well on Google for targeted keywords (“improve NPS score”). People who actually have the problem will easily connect it to your solutions in their head. Explaining how your tool actually works and what problems it solves with help you to build long-term relationships with your potential and trial customers. They will push your trial customers towards activation and upgrade by introducing new depth and value to the product’s features. Take a look at Trello, for example. Their “How to unlock project management perfection with Trello” is a perfect display of using quality content to drive user adoption and improve conversions. Throughout the article, the Trello team mentions various features which are accessible only in the premium packages, taking the opportunity to turn reader attention to product awareness of the difference between a free and paid Trello account. This journey through user onboarding and trial conversion optimization has finally come to a close. In the last 10–15 minutes, you learned the basics of the SaaS user journey stages and how to apply this with four trial conversion strategies. Testing transactional emails or simple in-app prompts doesn’t have to be a big job or involve the whole team. It’s better to run a bunch of small experiments and gather data than to spin wheels on building something perfect. Try improving transactional emails, deploying personalized in-app messages, showcasing your features in content, or using webinars for user onboarding. If you are looking for a platform that’s designed to run seamless onboarding webinars and is beautifully designed for your audience, we’d highly suggest you try Demio for free. Benjamin is the Head of Marketing at TryChameleon.com, a SaaS Platform for Targeted In-Product Guidance and Marketing. He's an experienced SaaS marketer and content strategist.